Transitional Deacon Timothy Wyciskalla’s journey of vocational discernment began in a bagel shop on the south side of Indianapolis. It took on speed while adoring the Eucharist on a field outside of Cologne, Germany, with then-newly elected Pope Benedict XVI and hundreds of thousands of other teenage Catholics from around the world. Then its course became more set in place as he entered into priestly formation during the past eight years at Bishop Simon Bruté College Seminary in Indianapolis and Saint Meinrad Seminary and School of Theology in St. Meinrad. That journey will reach its culmination on June 7 at SS. Peter and Paul Cathedral in Indianapolis when Archbishop Joseph W. Tobin will ordain Deacon Wyciskalla and three other transitional deacons to priesthood for service to the Church in central and southern Indiana. Born in 1987, Deacon Wyciskalla grew up as a member of St. Barnabas Parish in Indianapolis. His parents, Mike and Linda Wyciskalla, made sure that he and his three siblings always attended Mass on the weekend. They were also active in the parish in other ways, being involved in liturgical ministries and Catholic Youth Organization (CYO) sports teams in the Indianapolis South Deanery faith community. “I always kind of considered St. Barnabas kind of the center of our whole life,” said Deacon Wyciskalla. With St. Barnabas being a magnet for the family, they also appreciated its longtime pastor, Father Joseph McNally, who died in 2012. “I had a pretty strong example of the priesthood and of the good a priest can do,” said Deacon Wyciskalla of his boyhood pastor. After his sophomore year in high school, Deacon Wyciskalla stepped out of what he called his “Catholic bubble” when he was hired at a bagel shop on the south side of Indianapolis. None of his co-workers were Catholic, and some of them challenged him about his faith. The summer before his senior year at Roncalli High School in Indianapolis, Deacon Wyciskalla began to seriously consider if God might be calling him to the priesthood. He took those thoughts and prayers with him on a World Youth Day pilgrimage that summer to Cologne, Germany. 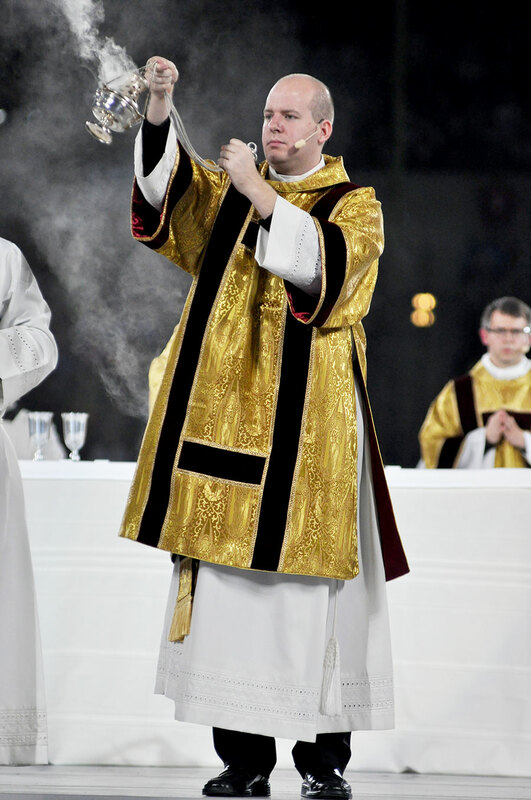 The night before the closing Mass of the event, Deacon Wyciskalla reached a turning point in his discernment as he prayed in adoration of the Eucharist with Pope Benedict and hundreds of thousands of other Catholic teenagers. In the fall of 2006, Deacon Wyciskalla enrolled at Bishop Bruté just two years after it had been established. Father Robert Robeson, Bishop Bruté’s rector, said that Deacon Wyciskalla helped to build up the community in the newly formed seminary. Benedictine Father Denis Robinson, Saint Meinrad’s president-rector, saw the same qualities in Deacon Wyciskalla during his final four years of priestly formation. “He’s very sociable,” Father Denis said. “But it’s not just being social. He’s building community. At the same time, Father Denis said that Deacon Wyciskalla challenged his fellow seminarians at Saint Meinrad in a way that invited them to grow. For his part, Father Robeson is anxious to see Deacon Wyciskalla ordained a priest. Deacon Wyciskalla said that getting to know during the past eight years other priests who serve in central and southern Indiana has helped him in his discernment and priestly formation. It has been through parish ministry assignments during his eight years of priestly formation that Deacon Wyciskalla has come to know the presbyterate and received a confirmation of his vocation. Over that time, he has served in Christ the King Parish and St. Joseph Parish, both in Indianapolis, Our Lady of Perpetual Help Parish in New Albany, St. Boniface Parish in Fulda, St. Malachy Parish in Brownsburg and St. Meinrad Parish in St. Meinrad. He sees the celebration of the Eucharist as being a special way of building those bridges. Deacon Wyciskalla will celebrate a Mass of Thanksgiving at 5 p.m. on June 7, his ordination day, at St. Barnabas Church. Father Denis will be the homilist at the Mass. His mother, Linda, is eager with anticipation for that special day. Deacon Wyciskalla shares that excitement about his ordination and Mass of Thanksgiving.